Roberts Vaux, born November 4, 1945 in Smoaks, South Carolina. Mr. Vaux attended schools in Beaufort County and the Choate School in Wallingford, Connecticut, followed by the University of South Carolina School of Business Administration (1968) and then the School of Law (1972). He was the Assistant Director for the 1st Heritage Golf Classic (1969). He worked for a small local law firm before opening Vaux Law Firm in 1973 on Hilton Head. A Bluffton office was opened in 1984. The firm became Vaux & Marscher in 1992. The Sun City office was opened in 1996. Mr. Vaux has been active in local affairs having served as Chairman of the County Emergency Medical Services Commission, Beaufort Memorial Hospital, Broad River Health Care, Beaufort Memorial Hospital Foundation, Town of Bluffton Beautification Committee, Town of Bluffton Development Corporation, co-founder Hilton Head Island Bar Association, Assistant Solicitor 14th Judicial Circuit, Vestry St. Lukes Church, and Church of the Cross. He is an avid golfer having played in the Bing Crosby National Pro-Am for four years and finished 4th in 1986. He is married to the former Mary A. Bolen and has four children. 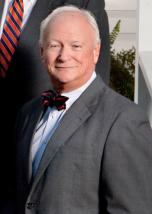 His son Roberts Vaux, Jr. (Tabor) joined the practice in June of 2012.